July 11, 2018, 12:30 p.m.
For the total population, Freeman’s positive rating has dropped from 84% before the accusations to 73% on June 24. This is a slight correction from June 10, where only 71% had a positive opinion. But the actor’s negative rating, which rose for 4% to 11% after the accusations, remains at 11%. While the actor initially saw a bigger drop with women than men, the fall from grace with men seems to have been more sustained. While 75% of men had a positive opinion of Freeman after the accusations, 74% did several weeks later. 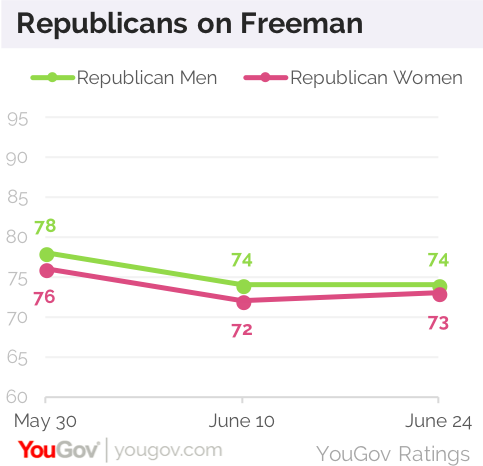 With women, Freeman’s positive rating hit 67% just after the accusations, but rebounded to 72% a few weeks later. This basic pattern remains true across generations. For instance, millennial men’s positive rating of the actor dropped from 86% to 81% to 75%, while millennials women’s moved from 82% to 61% to 67%. The pattern is also seen with Democrats, who favored the actor almost universally before the accusations. Republicans, on the other hand buck that trend; while they were less likely to have a positive opinion of the actor before the accusations, views on him have not dropped substantially for men or women. 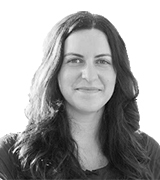 Learn more about YouGov Ratings.